INTECH now has released interactive whiteboard software version 4.3 that is based on the version 4.2. With this newly updated software, teachers have greater flexibility to provide collaborations in groups and drive students to engage the lessons in minutes. If teachers are going to execute multiple tasks, they would love INTECH interactive whiteboard software thanks to its improvement on split screen feature. Teachers can access this mode by clicking Split Screen button. At that time, a small pop-up notice will appear on the screen to allow to manage the screen space. 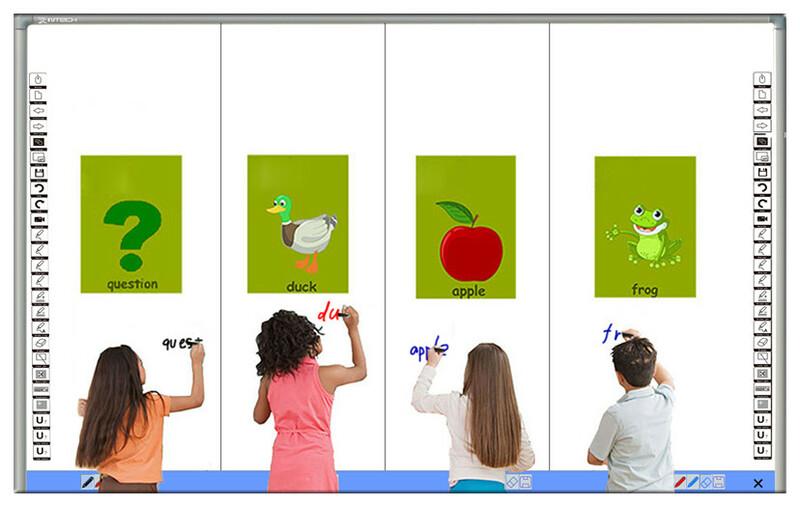 Educators can increase or decrease the amount of the whiteboard screen at their preference. It supports up to 10 screens for multitasking application, which means it permits 10 students to draw or writing in different screen areas simultaneously, but save their performance respectively. Consequently, teachers can take full advantage of this function to double the productivity and efficiency in the class. Bring your own device has become a hot trend in the education area. To stay abreast of the trend, INTECH develop its newest whiteboard software, combining the interactive whiteboard, to enable students work together for richer learning. Thereby, students can bring a variety of devices such as smartphone, tablet and laptop to connect with the host interactive whiteboard through WIFI. In this way, both teachers and students can reap a lot of benefits. At the aspect of students, they can learn in their own pace and collaborate by exchanging ideas in groups to go on a deeper journey for their learning. As for teachers, they can know the students’ performance and give the real time analysis. It is crucial for classrooms to have suitable infrastructure and software to support a wonderful learning environment. INTECH whiteboard software is exactly what you are looking for!